lOOK AT THIS GUYS AND ALL THE GOODIES YOUR CHANCE OF A LIFETIME. Was there a $1200.00 buy it now option on this? 3 hours into the auction and it's at $1100.00. I would have pulled out the plastic for that lot had it been a $1200 BIN. Of course that's if I'd come across it in time. WOW! Oh well, my grandfather told me a deal of a lifetime comes around about every 3 weeks. Ummm...does the equatorial behind the scope come with it? It doesn't look like a Unitron mount. More like a Mayflower. I wasn't sure about that either. I assumed it had been painted? The setting circles look Unitron-like to me. But then....I've never owned one. It looks pretty beefy though and the listing did say it came with both. yes there was a 1200.00 buy it now! no more someone bid low and it went away. Bidding started at 750.00. That's what happens on Ebay ,If I saw something I was interested in and the buy now was a little high,the first thing I would do is place a low bid just to get rid of the by now option. Then see what happens sometimes it works sometimes it don't.In this case maybe that was the wrong thing to do.Someone should have jumped on this fast. I saw the $1200 BIN when there were no bids yet. But, spousal approval was $1000 behind my checkbook. I figured it wasn't worth sleeping on the couch for the next 2-5 years. Boy did you guys blow it! This thing is all Unitron. Someone asked me if he should do a buy it now but I was asleep last night when he sent me the email. I told him he should ask for a picture of the lens area itself to prove it's the 3 inch. Take a close look at the focuser. I swear it only has one knob... Now I know the 60mm Model 114 Unitron does in fact have a single knob. But I don't know if the 3 inch altazimuth ones do. Also, look at the objective lens cell. I do not see the collimating ears there. To my knowledge, the 3 inch had the collimating ears outside the cell in the later model years. The early years (50's) did not. Can anyone here verify? How about R. Provin or Barry Simon? I wouldn't call it a steal as pictures always look better than reallity and these pics show the Equitorial needing lots of work. The RA motor is labeled 142 so the mount is for a 3 inch. It's a Unitron mount but someone likely changed the color. Not sure what the 4 extra mounting points next to the finder are for. Lot's of goodies so it's an interesting offer. Hey, its got that Duplex thingy too. I think those are more rare than the Unihexs aren't they? It's a Duetron. Saw one for sale on AM recently, I don't think they command a high price as they are not very practical and never really caught on. I'd like to have one but wouldn't drop major dollars on it. 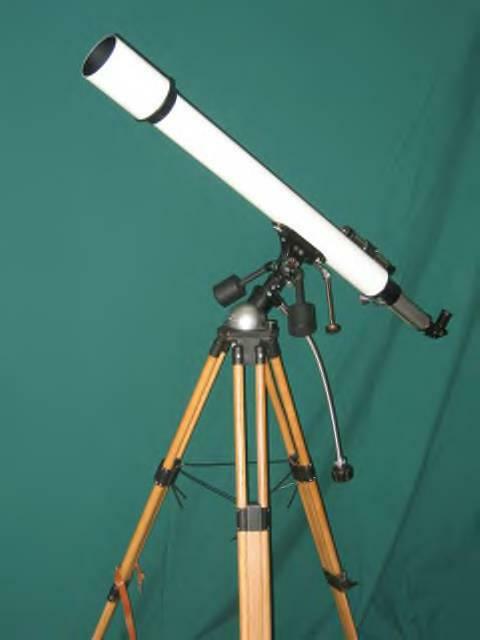 The single focusing knob must be characteristic of the 2.4" and 3 inch altazimuth models of Unitrons. There's another one that just went up for sale on AM. Look here: 3 inch altazimuth . Looks like one of the 1990's models...just before Unitron went defunct! Very interesting. I'll never understand why Unitron had a single knob focuser or any of their scopes. What did it save maybe a Dollar? Makes no cents (sorry for the pun). My early 2.4" GOTO refractor has one focus knob. Dad says it was a fairly standard practice back then. Perhaps it added 'distinction' (at the expense of 'practicality' ). How much is that one Lenny? One thing for sure....ain't cheap! That GOTO is a classic too! Before my time though. I am impartial to Unitron and Sears....but mostly Unitrons these days! Getting back to that Unitron on eBay...I have a feeling that price going to go a lot higher before it's all overwith. Why heavens, just breaking it up to sell parts will reap the return too! I was going to BIN last night but was real concerned about the shipping, not the cost but getting it in a million pieces. I havent been doing to well getting my scopes without shipping issues or damage! Besides I am working on another Unitron locally. If i get it I will drive the 75 miles and pick it up. It was THE scope to have for many decades. Name recognition, superb mechanical design and construction, excellent optics mean that these scopes will be good investments for a long time to come, despite their relative ease of availability. Your 4"er was (and is) a dream scope for many, one of the best examples I've seen.